A search revealed that John Wayne Hastings hails from New South Wales and appeared in Test no. 2064 at Perth in Dec 2012 ~ that test is better remembered for the heroics of Amla who helped SA make 569 in the 3rd innings and SA winning the test by 309 runs. 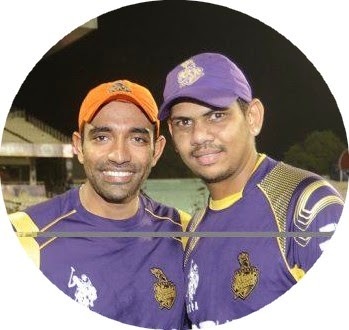 Uthappa has been a revelation ..... he mustered only 96 in 5 innings , at an average of 19.40 and a strike rate of 108.98 in the first leg at UAE as KKR did rather badly.... back in homeland Uthappa is on a roll scoring 392 runs in the India, when no other batsmen has managed to score even 300 runs. KKR has done a great turn around and captain Gautam Gambhir is quoted as stating he was satisfied but not surprised over his Kolkata Knight Riders' six-match winning streak which powered it to the playoffs of the Indian Premier League. Firstpost states that the southpaw also admitted that he wasn't superstitious but changed his jersey number thrice to get the rub of the green. "I am not a superstitious guy but still changed my jersey number thrice. Umesh (Yadav) told me to wear 77, Robin (Uthappa) told me to wear 23, though I used to wear number 5. But it is not about superstitious rather we sweated out for it," he said. Chennai got another defeat .. as SRH grounded them - powered by a 45 ball 90 by David Warner, unbeaten 64 by Shikhar Dhawan and their 116 partnership.